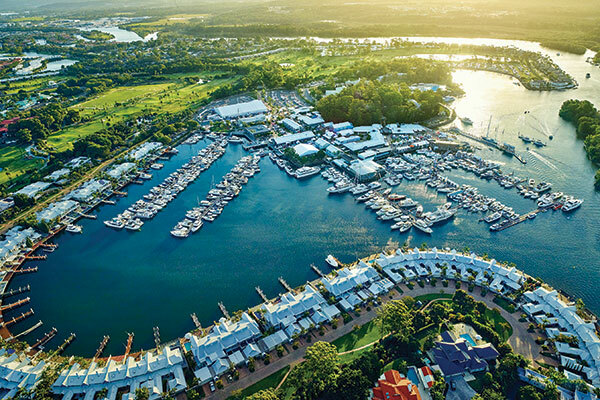 AFTER 30 YEARS BASKING IN THE WARM QUEENSLAND SUN, THE SANCTUARY COVE INTERNATIONAL BOAT SHOW RETAINS ITS MANTLE AS AUSTRALIA'S PREMIER NAUTICAL LIFESTYLE EVENT FOR THE MASSES AND EXHIBITORS ALIKE. The 30th anniversary edition of the Sanctuary Cove International Boat Show (SCIBS), held from May 24 to 27, is, according to organisers, shaping as the best in 10 years. SCIBS tells us an array of prominent marine brands have secured prime on-water positions alongside Australian boatbuilding icons Maritimo and Riviera, as well as throughout the Marine Village and in the Pavilions. Showgoers can expect to see a mix of long-term exhibitors and new brands, including Princess, Sunseeker, Monte Carlo, Gulf Craft, Fairline, Longreef, Integrity, Whitehaven, Palm Beach, Beneteau, Jeanneau, Grand Banks, Leopard Catamarans, Clipper, Sirocco Marine North, Multihull Solutions, Multihull Central, Lagoon, Eyachts, Horizon Motor Yachts Australia, Dometic Seabreeze, BLA, Navico, Stella Systems, Yanmar, Twin Disc, Ronstan, Club Marine, International Paint, and list rolls on. SCIBS sales and exhibition manager Dominic O’Brien says more than 170 boats will be displayed on-water, from superyachts to sailing boats, motoryachts, mono and multihulls, promoting every segment of the boating lifestyle. "The Gold Coast is known as the gateway to the cruising grounds of the Whitsundays, so it makes sense to have a superlative showcase of multihulls, both power and sail, for visitors to explore," said O'Brien. SCIBS says trailerable boats will once again have a strong presence throughout the Marine Village, with increased space allocated to sport, fishing and leisure boats where the latest tinnies, fibreglass hulls, RIBS and PWC’s will be on show. Gold Coast-based luxury motoryacht builder Riviera returns to SCIBS in 2018 after an absence of five years and brings with it a multi-million-dollar showcase including two world premiere models. "Riviera is a major force in the global marine industry and we are pleased to have them join a host of leading motoryacht brands at this year’s Show," said SCIBS general manager Johan Hasser. Having launched more than 5200 motoryachts over its 37-year history, Riviera’s display will represent the brand’s five model collections: the SUV, Flybridge, Sports Motor Yacht, Sport Yacht and the Belize motoryacht range. 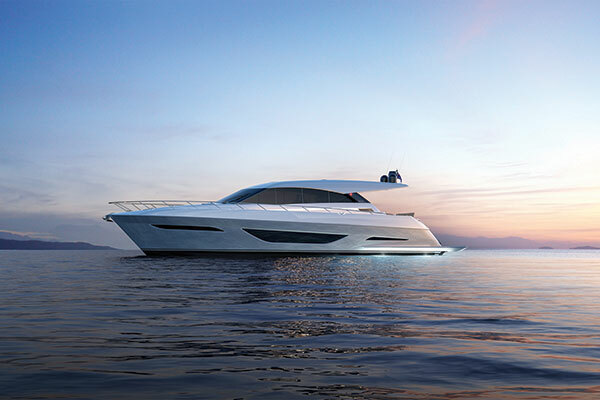 "Over the past five years (and since Riviera's last appearance at SCIBS), we have created 12 new models and launched two entirely new motoryacht designs with our class-defining, long-range 68 and 72 Sports Motor Yacht collection, and our sporty and adventurous SUV Collection featuring the 445, 525 and 575 models," said Riviera owner and chairman Rodney Longhurst. 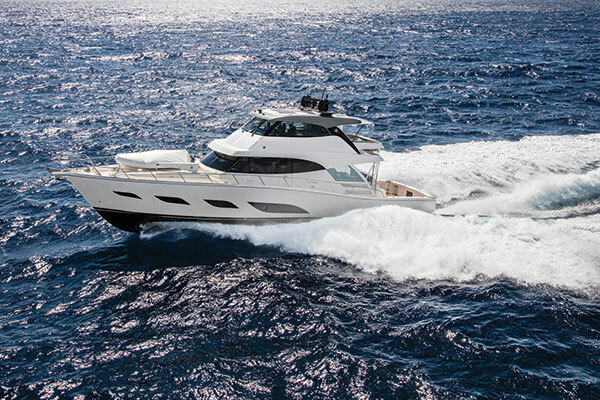 At SCIBS, Riviera will stage the world debuts of its sporty 395 SUV and 72 Sports Motor Yacht. The new 395 SUV features an entirely new hull and deck design, raised bulwarks on the sidedecks, and a wide, open cockpit designed for relaxing and entertaining or as the perfect watersports platform. The 395 SUV offers two staterooms and a large bathroom on the accommodation deck, as well as a saloon with fully-equipped galley aft, dinette opposite and a forward helm to port. 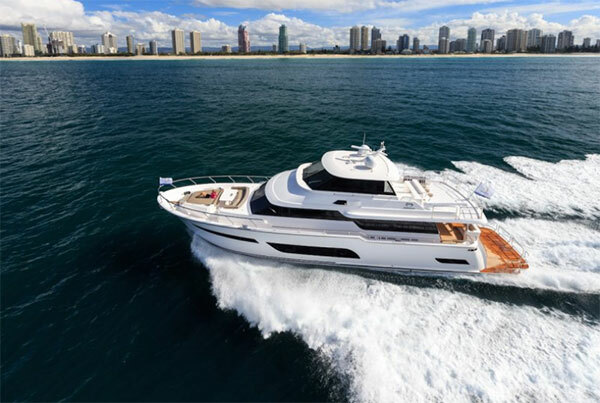 Riviera said the 72 Sports Motor Yacht has been designed to offer sports performance and luxurious comforts with superior offshore and extended cruising capabilities, delivering "whisper-quiet performance and super-smooth running at speed". Notable are the expansive cockpit suiting serious sportsfishers and watersports enthusiasts alike, a massive entertainer's foredeck and alfresco dining opportunities with an elevated and covered mezzanine. The accommodation deck offers two stateroom options: the four-cabin Classic or the three-cabin Presidential with full-beam master stateroom. Like Riviera, Maritimo manufactures on the Gold Coast and is renowned for it's blue-water long-range luxury motoryachts. The company, headed by the doyen of modern Australian recreational boatbuilders Bill Barry-Cotter, stages the launch of the X60, along with eight additional boats on-water including the S51, M51, M59, S70 and M54. The shaft-driven Maritimo X60 is described as the most technologically advanced vessel the company has ever manufactured, with performance and systems developed collaboratively with the Maritimo Racing team using race-proven components and the latest 3D modelling and fluid dynamics software. In a world first for a vessel of its size, the Maritimo X-60 design features a large aft cabin and en suite accessible from both the swimplatform and saloon, which the marque says "provides customers with customisable spaces only seen on larger superyachts". The innovative aft cabin allows owners the choice of three distinct configurations: a beach club cabana, a large tender garage or an additional queen stateroom. The flagship of the brand, the Maritimo S70 sedan cruiser is the largest single-level vessel the company has ever produced. A big-volume passagemaker, the S70 delivers all that the M70 does and more on a single level, with four cabins, including the Maritimo hallmark: a full-beam apartment-sized master cabin, three bathrooms, and a large saloon and helm area. Boasting a top speed of almost 30kts and the handling of a large runabout, Maritimo said the S70 is the perferct combination of luxury, style and performance. Eyachts will exhibit an eclectic mix of European powerboat brands at SCIBS, including Axopar, Fjord, Greenline and Sealine, as well as hosting an owners’ and VIP lounge on a floating pontoon. The team is bringing with them a large selection of dayboats catering to all budgets and lifestyles, with something for everyone, from outboard power, sportscruisers with sterndrives, to shaftdrive diesels. In Australian show debuts are the unique Axopar 37 Sports Cabin and the triple award-winning Axopar 28 T-Top, complete with aft wetbar. Also making its Sanctuary Cove debut will be the Axopar 37 Sun-Top, described as the perfect boat for entertaining up to 10 people and featuring extended shade top, walkaround side and spacious aft-deck. On the water is the innovative Greenline 39 with its optional hybrid propulsion system and solar energy, while the sporty Sealine C330 is on a return visit to SCIBS, after being one of several boats sold at last year’s event. Rounding out the Eyachts exhibit will be either the Fjord 40 or 42. These Mediterranean-styled craft are the ultimate in top-end dayboats, with inboard IPS diesel engines and plush finishes for entertaining. Horizon Motor Yachts Australia (HMYA) is hosting the global launch of the long-range cruising model and new release V81. Horizon will also have a new E75 on show too, a model which we're told proved popular after it sold on day one of the 2017 Sanctuary Cove International Boat Show. Visitors can also expect to see Horizon's E88, which is 94ft overall when you take into account the oversize swimplatform, along with the E56XO express cruiser which has been specifically designed for Australian boating. "It’s our home show, so we always go all out," said HMYA marketing manager Erica Rae. "We find that people come from New Zealand and Perth, including our owners. It’s a great time of year with a fantastic atmosphere, free entertainment and a host of restaurants in The Marine Village, so it all adds up to a great four-day holiday for them." Horizon Group CEO John Lu will be joining the team from Taiwan, celebrating SCIBS’ 30th anniversary with special events for VIPS and an unveiling of the V81. British luxury brand Princess is showcasing the V48 0pen, the new S65 and a third yet-to-be-confirmed boat, with these vessels ranging in price from $1.6m to $4.8m. The Princess floating office at SCIBS will be decked out with a galley and lounge to cater for VIP and client events. 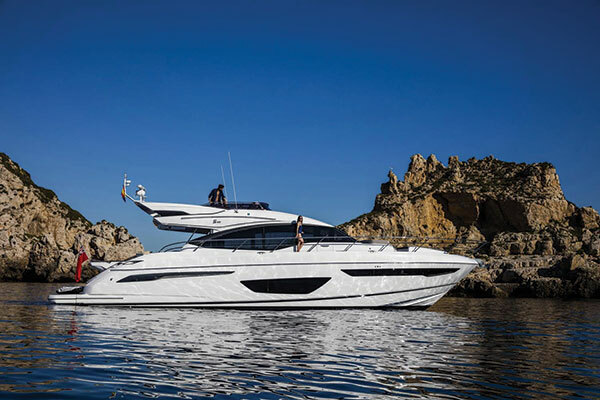 A representative from Princess’s UK management team will attend SCIBS to unveil the Princess S65 flybridge model, which boasts a hydraulic swimplatform, tender garage, galley up and aft format, and walkthrough foredeck with sunpads and seating. The slender and streamlined S65 boasts a lightweight deep-vee hull that is said to deliver power with agility up to 38kts, as well as four cabins including a full-beam master. 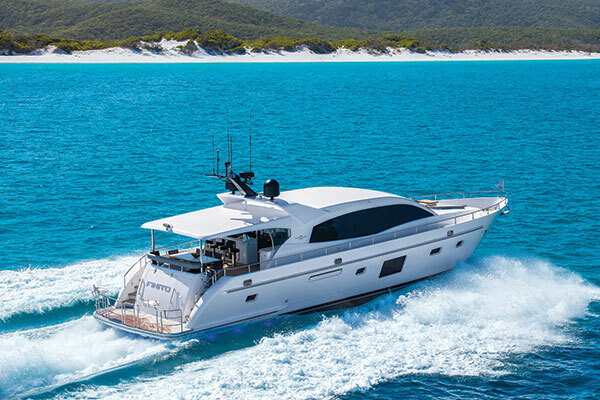 Whitehaven Motor Yachts will host owners, VIPS and guests aboard its 7500 Sports Yacht Finito at Sanctuary Cove, as an example of the builder’s superbly-crafted motoryachts. Whitehaven says Finito is being offered for sale, too. 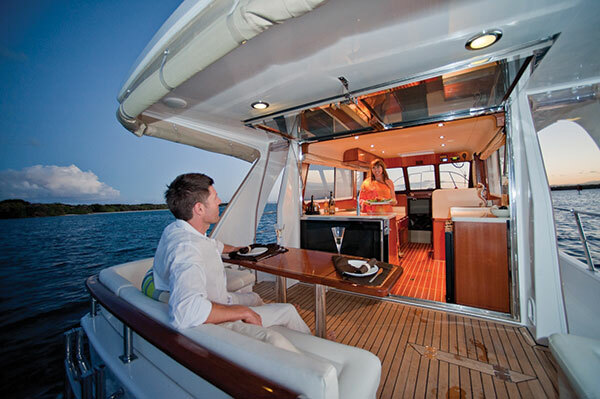 Her Darwin-based owners are said to be eager to continue their Whitehaven journey, dreaming bigger and planning to design and build their new Whitehaven luxury entertainer to their own specifications. Conveying the timeless appeal and the almost limitless scope Whitehaven owners have to bring their dream motoryacht to life, Finito comprises the Whitehaven hallmarks of bespoke luxury and customised details, harnessing precision craftsmanship, expertise, superior engineering and a the boating experience of its owners. Whitehaven will also reveal details at SCIBS of what will be game-changing additions to its fleet: the Harbour Classic 40 and the entirely new Whitehaven coupe Euro Edition 6100. "Guests will enjoy an interactive, immersive experience within our exhibition area, which for the first time will be based at our new Sanctuary Cove HQ which we share with our sister brand, Integrity," said Whitehaven general manager Peter Pembroke. "Joining forces with that brand in 2017 has opened up myriad opportunities for increased resources around R&D, engineering, supply chain and overall a better customer outcome." Integrity Motor Yachts is displaying three new-generation sedan models: the 320, 380 and the 440, all with updated styling. The company said these boats display the distinct qualities people associate with Integrity, such as flowing entertainer’s cockpit and saloon with stainless steel hopper window, economical performance and maintainence, good resale value, wide walkaround decks, and more. Since 2008, Integrity has sold more than 90 of its long-range cruisers. Integrity says its owners "love the spacious layouts, flow-through from cockpit to saloon, large cabins with lots of storage, all the mod cons and ability to add custom touches during the build process". Integrity added that testament to the popularity of its range, is the fact that it has nine boats currently in build and six of them with customers’ names on them. Check out the full feature in issue #503 of Trade-a-Boat magazine. Subscribe today for all the latest boat news, reviews and travel inspiration.